The rand had been the world's best performing emerging market currency this year. South African president Jacob Zuma's Thursday night firing of respected finance minister Pravin Gordhan sent the South African rand tumbling and raised the possibility of a split in the ruling party. As reports surfaced that Gordhan was to be dismissed the currency weakened, losing five percent on the week to 13.4 rands to the dollar. The rand had been the world's best performing emerging market currency this year and traders expect the rand to move lower still. On Friday, deputy president Cyril Ramaphosa, a top candidate to succeed Zuma as African National Congress leader at the end of the year, called Gordhan's ouster "totally unacceptable." Despite this open break with Zuma, Ramaphosa said he would not resign as his deputy. Gordhan has a reputation for probity and fighting corruption. Earlier this week he was abruptly recalled from London where he was assuring fund managers and investors that South Africa is fiscally stable and a reliable partner. With growth below 1% last year, South Africa is in danger of a credit downgrade that would increase its foreign borrowing costs. The news of the firing, and the further demise of the rand, also sent shares of Old Mutual (ODMTY and Investec (ITCFY , two London-listed financial services companies with big exposure to the South Africa, tumbling. Old Mutual's stock was trading down 7.24%, changing hands at 201.30 pence ($2.50 per share) in London on Friday. Meanwhile, Investec fell 4.30% to 577.50 pence Friday midday in London. A defiant Gordhan Friday dismissed intelligence reports that he held secret meetings in London that undermined the government as "absolute nonsense." He said he and his deputy had not been for sale to corrupt people. The dismissal of Gordhan and his deputy was part of a broader cabinet reshuffle that shifted Zuma ally Malusi Gigaba from home affairs to finance. Opposition parties promise a no confidence measures in parliament. Zuma, 74, has been South African president since 2009. He also heads the African National Congress, the party of Nelson Mandela that has been dominant since full democracy arrived in 1994. Confronted with persistent allegations of corruption and nepotism, Zuma has faced mounting pressure from within the party to resign. His term extends into 2019 but the ANC is likely to choose his successor in December. This is not the first time that Zuma has ousted his finance minister and sought to bring the ministry under tighter control. In December 2015 Zuma dismissed Nhlanhla Nene, replacing him with an unknown back bencher with little financial experience. 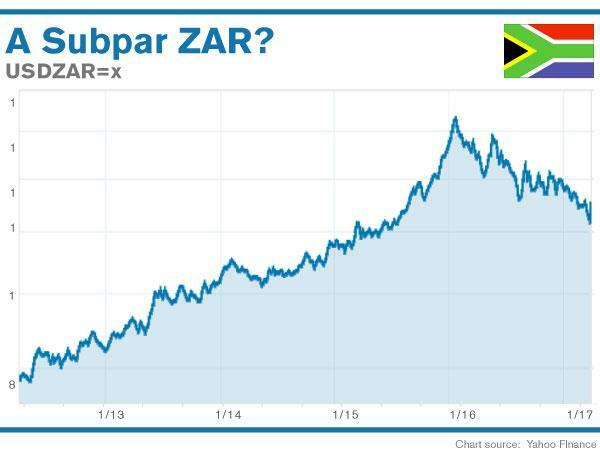 A sudden drop in the rand and pressure from the business community forced Zuma to reverse course after four days and bring in Gordhan, who was finance minister from 2009 to 2014. Gordhan has been embroiled in a long-standing feud with the Gupta family, immigrants from India, who have close business ties to Zuma. The Guptas allegedly orchestrated the ouster of Nene in 2015 because he prevented the family from acquiring lucrative state contracts. This year the Guptas brought legal action against Gordhan, blaming him for closing their credit lines with leading South African banks. Respected financier Trevor Manuel, finance minister under Nelson Mandela, said in 2016 that removal of Gordhan "would destroy the South African economy." Manuel heads the Rothchild's banking affiliate in South Africa. Under Gordhan's tutelage the rand strengthened, recovering from the 16 to the dollar level it touched in early 2016. Johannesburg is Africa's biggest financial center and South Africa after Nigeria is the continent's largest economy. Persistent weak growth is blamed on the Zuma government's erratic policies and perceived hostility to the business community. Zuma has accused Gordhan of standing in the way of radical economic transformation, in which the state is a dominant player. The ouster of Gordhan poses significant risks for Zuma and the ANC. The opposition Democratic Alliance made significant gains in municipal elections last year with the ANC losing control of Johannesburg, Pretoria and Port Elizabeth. Cape Town, with a booming tourism and property market, has long been ruled by the Democratic Alliance. Parliamentary elections are scheduled in 2019. In the 2014 elections the ANC share of the vote fell to 62% compared to 24% for Democratic Alliance. Columnist Barry D. Wood is a regular visitor to South Africa and spent three years as a correspondent of the Financial Mail in Johannesburg.